Despite strong profits and share growth, Ford hit turbulence as it introduced new technology and vehicles. January 2010: CEO Alan Mulally announces plans for MyLincoln Touch to debut that summer on the 2011 Lincoln MX; Ford vehicles to follow. 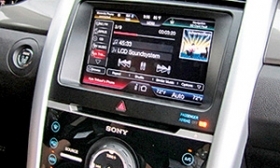 December 2010: Ford acknowledges customer problems with MyFord Touch. August 2010: Consumer Reports calls MyFord Touch "a complicated distraction," declines to recommend Ford Edge and Lincoln MKX. January 2011: Ford brand drops to 23rd, from 5th, in the J.D. Power and Associates Initial Quality Study; Lincoln drops to 17th, from 8th. June 2011: Transmission failures, shifting problems force a recall and modifications to PowerShift transmission. October 2011: Consumer Reports rates the Ford brand 20th in automotive reliability, down from 10th. November 2011: Mulally promises Ford will fix problems with the MyFord Touch. June 2012: Ford finishes 27th in the J.D. Power Initial Quality Study; Lincoln 18th. July 2012: Ford recalls all new 2013 Escapes because carpet padding could interfere with pedals. July 2012: Ford recalls multiple vehicles for fire risk with 1.6-liter EcoBoost engine; second Escape recall in a week. September 2012: Ford recalls the 2013 Ford Escape 1.6 EcoBoost models again because of a second fire risk. October 2012: C-Max Hybrid deliveries begin; consumers complain about fuel economy lower than 47 mpg EPA rating. October 2012: Ford ranks 27th in Consumer Reports survey of automotive reliability; Lincoln 26th. December 2012: Ford recalls 2013 Escape and 2013 Fusion for fire risk. 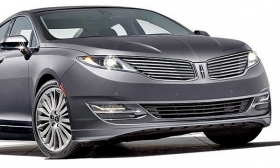 January 2013: Quality issues delay launch of Lincoln MKZ for about four months. May 2013: National Highway Traffic Safety Administration begins investigation of F-150 pickup with EcoBoost engine after lawsuits, complaints about stalling and loss of power. May 2013: Ford recalls 2013 Fusions for possible steering problems, new fire risk. June 2013: Ford brand ranks 27th in the J.D. Power Initial Quality Study; Lincoln 17th. 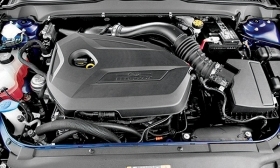 July 2013: Ford announces software to improve C-Max fuel economy.